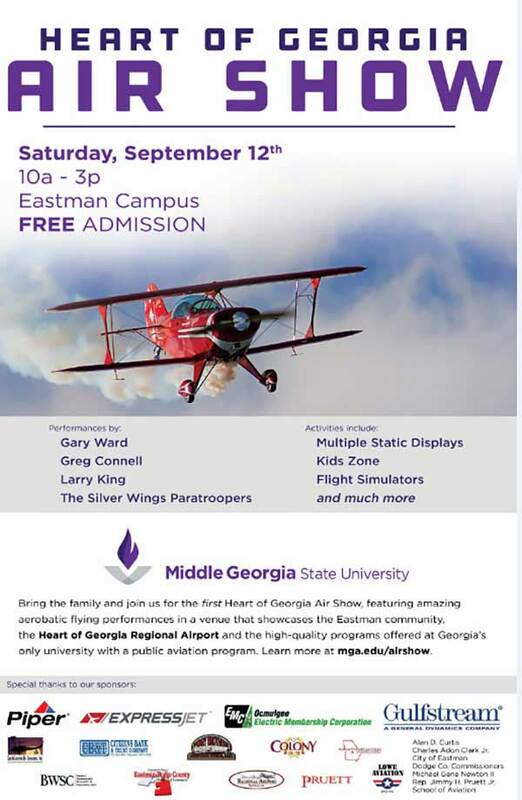 The first Heart of Georgia Air Show, part of Middle Georgia State University’s 2015 homecoming celebration, takes to the skies from 10 a.m. to 3 p.m. Saturday, Sept. 12, on the Eastman Campus, which is east of Eastman on Georgia Highway 46, adjacent to the Heart of Georgia Regional Airport. The show, featuring amazing aerobatic flying performances, is free and open to the public. Scheduled to perform are Gary Ward, Greg Connell, Larry King and the Silver Wings Paratroopers. A “Kids Zone” and aviation-related displays and demonstrations are also part of the air show. Middle Georgia State plans to make the air show an annual event. This year’s Gold Sponsors are Express Jet, Gulfstream, Ocmulgee Electric Membership Corporation and Piper Aircraft. Show co-hosts are the city of Eastman, Dodge County and the Heart of Georgia Regional Airport. Directions to the Eastman Campus/Heart of Georgia Regional Airport are at www.mga.edu/about/maps.aspx. For more information about the air show, see www.mga.edu/airshow or contact the Office of Development & Alumni Affairs at (478) 471-2732 or development@mga.edu. Middle Georgia State University’s Eastman Campus is home to the state’s only public School of Aviation, which offers programs in flight (airplane and helicopter), air traffic management, aviation maintenance technology and aircraft structural technology. The school is also the home of the Institute for Applied Aerospace Research, which works in collaboration with the National Aeronautics and Space Administration (NASA) fabricating flight-worthy hardware and test articles for the James Webb Space Telescope. Middle Georgia State has received Federal Aviation Administration (FAA) approval for Certificates of Authorization to operate Unmanned Aerial Vehicles (UAVs) – testing airworthiness and developing operational processes.